Abawi: That's a question that's not being answered by American officials here in Afghanistan at the moment. What we are hearing is from the Taliban. It comes from a statement. They are saying that they actually infiltrated the Afghan National Army, and that it was actually an Afghan soldier who was able to make it on that American base, able to make it into the gymnasium, where he detonated his suicide vest, killing the seven employees of the CIA. But when I spoke to the Ministry of Defense, a spokesperson in Afghanistan today, he says that that's not true, that it can't be an Afghan soldier, because the Afghan soldiers go through a thorough check before they enter any American military base. But the Taliban claims that they will be infiltrating the Afghan National Army, an army that's trying to grow its numbers right now, an army that is desperate for numbers right now. So it seems to be more about quantity than quality, giving the Taliban a prime chance to infiltrate. The Afghan Taliban has claimed responsibility for this attack. But the Taliban in Pakistan is also claiming it was behind the attack. There is the Pakistani Taliban. There is an Afghan Taliban. But at times, they are one in the same, especially in this area, in Khost province. 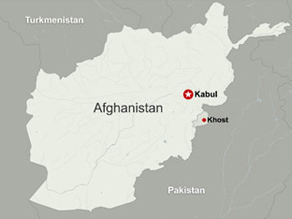 If you look at a map, you see where the base was in Khost - it borders Pakistan. This is an area run by a group called the Haqqani network, run by Jalaluddin Haqqani and his son, Sirajuddin Haqqani. But what's interesting here, though, is that Jaluluddin Haqqani was the mujahideen fighter against the Soviets in the 1980s, and it's said, too, that he was funded by the CIA through the Pakistani intelligence, the ISI. So, that's something to think about right now, 20 years after the fact that Jaluluddin Haqqani was once seen as an ally, and obviously now he is targeting the CIA.